Every once in a while, two entirely separate entities come together for a common purpose. A social media intern walks into a bar and the outcome is a partnership that benefits everyone involved, especially the Veterans. When Gil (our Executive Director) had the idea of a blanket drive to help supplement our new transitional housing units, I immediately thought about Famous Pub. Tony has been the owner of “Famous” for 30 years. He and his wife Patty have been part of the community for a number of years, and always find new ways to help those less fortunate. Being heavily involved with the church has brought what they consider to be blessings into their life, and as a result they have been able to give back in more ways. 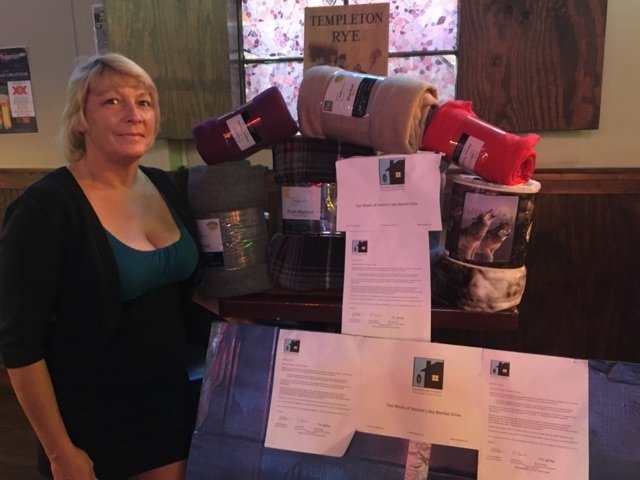 They were more than happy to be part of our “Two Weeks of Veteran’s Day” blanket drive and proudly displayed our donation boxes at the front of their restaurant. Our drive for Vets meshed perfectly with the American Flag being proudly flown in the dining room. The Manager, Denise, who is also Patty’s cousin was available to organize and even helped paint the boxes, so I guess you could say generosity runs in the family. Homes of Light would like to thank Famous Pub for their support and we look forward to another collaboration in the future.